That’s right, folks. I wrote 50,000 words in one month. I dedicated all of November to writing out my second Grover Cleveland novel, no matter how bad it sounded in type. It was certainly a bumpy road. There were some days when I would write over four thousand words, and some days when I couldn’t get out more than three or four hundred. During Thanksgiving weekend, I didn’t write at all (I read an entire novel and spent time with my family instead). In the end, though, I was successful. Around 4:30 pm on November 30th I crossed the 50k mark. Which is good, because I had just thought of something that would change the end scene that I was writing dramatically, and I wanted some time to ponder of these consequences before diving into it. So I finished my paragraph, uploaded it to the nanowrimo website, and validated my word count and counted myself finished for the month. And now here we are, three days into December. The good news is that I have 50,000 words down that weren’t there before. I have a whole new plot, new characters, and I’ve delved even further into the phsyches of my old characters while giving them a new adventure to embark upon. The other news is that there is only more good news! The good news is that now I get to finish my novel. I think I’ve got around 10k words left. And then I get to rewrite the whole thing, adding some subplots that I forgot about earlier. And then I get to edit it, and have it edited by others! Maybe it sounds boring or like some long punishment to you, but these are definitely my favorite parts. I spent so many years revising Into the Flames that I can barely remember writing the first draft. Taking what I’ve already written and polishing it is such a joy to my perfectionist nature. And NaNoWriMo has helped me come a long way from my former self. I used to enjoy rewriting so much that I would only get about five chapters into a novel before finding myself starting over from the beginning. I’d try to get that real punch into my first page, add character details I didn’t know about the first time around, and cull pointless scenes. I’d do this three or four times before I dropped the idea entirely, exhausted from the rewriting and never being able to get to the conclusion. But with NaNoWriMo and the added incentive of actually being published someday, I forced myself to finish a novel before rewriting. To actually see that last scene written down rather than only played out in my head. It was very rewarding to see. I could then rewrite to my heart’s content with my end goal before me. That’s why, even though I haven’t gotten the chance to write the end on Grover Cleveland 2, I’m going to make sure that I do before I set it aside for revision. You can’t know where you’re going until you see where you’re coming from, or something clichéd like that. 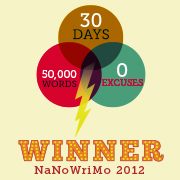 Congratulations to everyone who participating in NaNoWriMo 2012! Did you reach your personal goals for the month? Did you learn anything about yourself or your writing in the process?